Indianapolis, IN - After recent visits of two distinguished men – a missionary from Indonesia, Archimandrite Daniel Byanturo and Bishop Longin for the church Slava, St. Nicholas Church in Indianapolis received another great blessing on Monday, December 14/27. It was visited by a delegation from Hilandar Monastery on Mt. Athos. Accompanied by the Diocesan Secretary,Archpriest Milorad Loncar, the Abbot of the Monastery, Archimandrite Metodije, Hierodeacon Arsenije and the Director of the Foundation of Hilandar Monastery, Mr. Milivoje Randjic, arrived in the evening from Ohio. /the highly esteemed guests were welcomed by joyful ringing of church bells, bread and salt and by excited hearts of about one hundred parioshioners of this church, as well as quite a few faithful from other Orthodox churches in the city and three nuns from St Xenia’s of St. Petersburg Metochion. The clergy, which also included Fr. Steven and Dcn. Michael from the Bulgarian jurisdiction, served an Akathist to the Three-Handed Icon of the Mother of God in English, Serbian and Church-Slavonic. After the Akathist, the host, Priest Dragan Petrovic, who last summer led a group of parishioners to Hilandar, was deeply moved and expressed great gratitude to the guests for this extraordinary opportunity to return the hospitality and for this inexpressible honor given to the church by their coming, as a part of the first, historical visit of an abbot of Hilandar Monastery to the American Continent. “With your coming, you have brought Hilandar, Mount Athos, the Mother of God and her Son to us,” Fr Dragan pointed out and added that ”The Three-Handed Mother of God, which adornes our church, has never been as radiant as it is tonight.” Then he asked the Abbot to address the people. 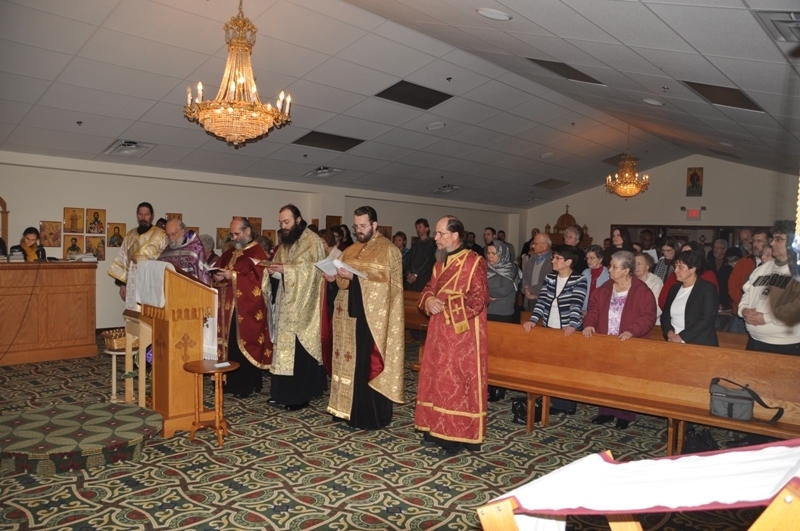 Archimandrite Metodije began with words of thanksgiving for the very warm welcome and then noticed with joy that the church community is ethnicly diverse, but united in the holy Orthodox faith. In a manner of monastic humility, he added that their small delegation is not able to bring more than the blessings of their holy predecessors in the monastery, as well as the witness that nothing that was heard in the Akathist about the miracles of the Mother of God was unreal, made up or exaggerated. Everything is an every-day reality of the Holy Mountain. The Abbot emphasized a special respect that the monks of Hilandar Monastery offer to the Theotokos as their Abbess. Before the start of fullfilling any monastic obedience, they bow down before her Three-Handed Icon and receive a blessing. Then he shared a very interesting story about a miraculous healing of a paralyzed woman from Thessalonica after the Mother of God appeared to her in a dream, in which she mentioned Hilandar Monastery and her icon in it. Abbot Metodije concluded that the memory of all above-spoken miracles is intended to strengthen our Orthodox faith, which we are obliged to preserve and pass on to future generations in all the purity and beauty in which it has been handed down to us by our holy fathers and ancestors. In our time, this seems to be a challenge greater than ever before. At the end of the address, all the present received a blessing from the Abbot. Along with the blessings, they were gifted copies of well-known icons from Hilandar and a big, beautifully prepared book on the Monastery in English for the church library. The gathered people then wholeheartedly collected a significant donation for the renovation of Hilandar, upon Fr. Dragan’s request, so that by giving, they follow the example of Serbian kings and emperors, who built this holy habitation. The fellowship was continued in the church’s social hall with a lenten meal, prepared with much effort and love by the Kolo Sisters, according to old recipes from Serbia, Russia, Romania, Eritrea and other countries where they come from. Although the hour was late, and a long way to the Monastery of the Mother of God in New Carlisle, Indiana, was ahead of the guests, as well as a new working day ahead of the hosts, it was hard for all to depart, but they did so, taking mutual love and joy over the magnificent and unforgettable event with them.